C'est à l'occasion de ses 20 ans que la firme Russe Kaspersky décide de rentrer en pleine concurrence contre Microsoft en proposant un antivirus gratuit. 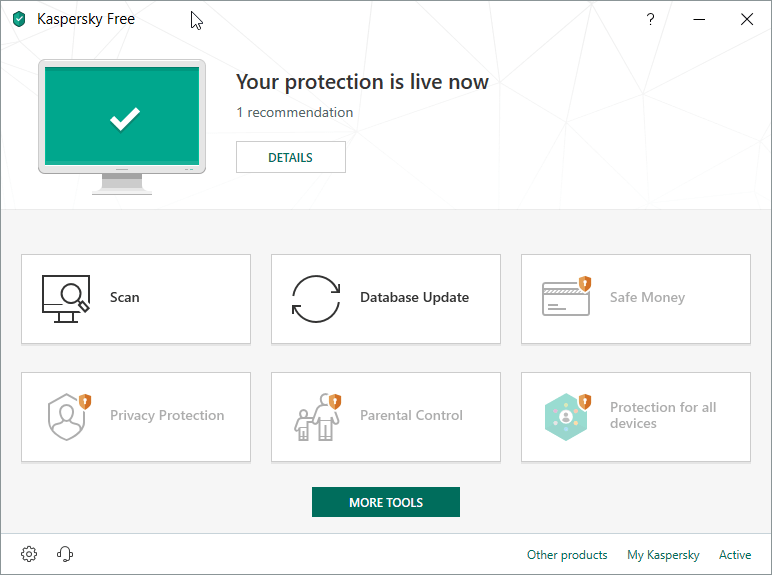 Pour le moment disponible qu'en anglais, Kaspersky Free Antivirus est une version légèrement castrée de Kaspersky Antivirus qui ne rogne pas les performances de détection par rapport à son grand frère. It is now possible to scan scripts using Antimalware Scan Interface (AMSI). AMSI is a standard Microsoft interface that allows scanning scripts and other objects. The component can only detect a threat and notify about it, but it does not handle threats. The component is available in Microsoft Windows 10 or later. The Tools window has been improved. Application features are now categorized to help you find specific features faster. The display of notifications has been improved. Notifications that are not critical for application performance are not displayed while the user is in full-screen mode. The Recommended settings window has been improved. The "Delete possibly infected objects" check box and the "Detect other software that can be used by criminals to damage your computer or personal data" check box have been added.